As we head into the offseason, the Mets are likely trying to figure out which direction to go when it comes to planning next year’s team. One can argue that the only positions set in stone are shortstop (Amed Rosario), left field (Yoenis Cespedes) and right field (Michael Conforto), although Conforto may not be fully ready to go by Opening Day. Other guys who figure to be regulars are Dominic Smith (1B) and Travis D’Arnaud (catcher). Translation? There are still several spots up in the air. The online sportsbook odds for the Mets 2018 season would seem to indicate that changes are abound in Flushing. If I held up a crystal ball, I’d say either a free agent or Asdrubal Cabrera (if option is exercised) will start the year at the hot corner. The Mets could use Juan Lagares in CF with a lefty platoon mate (Brandon Nimmo?) 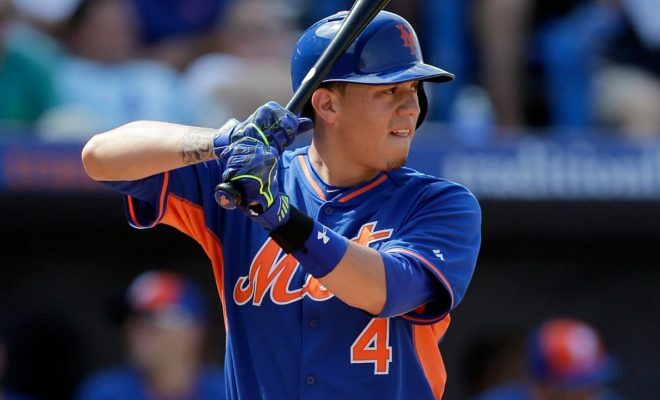 One question that’s on many people’s mind is this — what happens to Wilmer Flores? One thing’s for sure…Wilmer can hit, especially against lefties, so he’s an attractive commodity, whether it’s for the Mets or for someone else. To me, the best use for Wilmer is against left handed pitching, so he can rotate with Cabrera at 2B or Dom Smith at 1B, although he is not the best defender, no matter the position he’s manning. A couple of years ago, the famous crying incident happened, when Flores was nearly dealt, along with Zack Wheeler, for Carlos Gomez. The trade ultimately fell through, and the Mets ended up getting Yoenis Cespedes. It’s safe to say that was a good-no trade to this point. You can argue that Wilmer alone has been better than Gomez, although Wheeler has yet to prove he can stay healthy for an extended period of time. So what do I think the Mets do with Wilmer? Platoon, and he’ll get his at-bats. He shouldn’t play everyday, in my option, but he can be a valuable weapon. Guys who mash lefties don’t grow on trees, so if the Mets make any sort of run in 2018, I expect Wilmer to be a big part of it. Next Story → How Do You Feel About Mickey Callaway Hire?